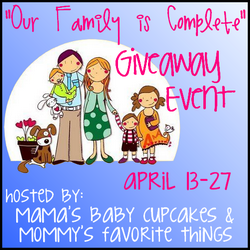 Mommy's Favorite Things: "Our Family is Complete" Giveaway Event Announcement! "Our Family is Complete" Giveaway Event Announcement! Mama's Baby Cupcakes and Mommy's Favorite Things have used their blogs to share pregnancies, births, and the opportunity to watch their children grow, but now that our families are complete, we want to put together a fun event to celebrate just that!! "Our Family is Complete" Giveaway Event will consist of companies we've used throughout our journey of pregnancy and babies, to showcase some amazing companies and what they have to offer. Running April 13-27 one winner will win the whole prize pack we're starting to get together, and we already have some amazing products. If you're a sponsor and would like to be featured, email either Michelle or Heather for more information and what your thoughts on giveaway items could be. If you're expecting or just starting a family, this event is for you!! Don't forget to stop back by and enter this giveaway, helping us celebrate our families, our children, and the great companies we've used along the way! Can't wait to see what you guys come up with. Such a cute giveaway idea.